TOBA, Japan (AP) — There is the soaring rhetoric. And then there’s the messy reality. When U.S. President Barack Obama and Japanese Prime Minister Shinzo Abe make a historic visit to Hiroshima on Friday — the first time a sitting U.S. president has visited the site of the first atomic bomb attack — their words advocating nuclear disarmament will clash with real-world security necessities. Japan’s long postwar commitment to disarmament, meanwhile, is only possible because of its reliance on the so-called American “nuclear umbrella” that protects it from antagonistic North Korea and China. Tokyo, should it choose, could probably easily convert its advanced civilian nuclear program into a weapons program, and some conservatives in Abe’s ruling party have argued that the country’s pacifist constitution technically allows nuclear weapons. In advance of flying to Hiroshima, Obama said Thursday that the dropping of the atomic bomb was an inflection point in modern history and something everybody must deal with. Obama’s vision of a world without nuclear weapons was challenged almost immediately. His April 2009 speech in Prague happened within hours of North Korea’s launch of a long-range rocket that outsiders, including the United Nations, called a cover for a test of banned missile technology. Pyongyang is still barreling ahead in its push for nuclear-armed missiles that could reach the U.S. mainland. Obama secured a deal meant to limit Iran’s nuclear program, if it can be implemented amid mistrust on both sides. But Pakistan and India are still locked in a nuclear standoff. The United States and Russia, which have most of the world’s nuclear weapons, often see their geopolitical jockeying for position interfere with disarmament efforts. And there are growing worries about the security of nuclear fuel sites around the world. Obama’s trip to Hiroshima also comes amid anxiety that North Korea’s growing nuclear and missile capabilities could lead to the top U.S. allies in Asia, Japan and South Korea, starting their own nuclear weapons programs. It is highly unlikely either country will go nuclear. It could cause huge political and economic damage — crippling sanctions, global condemnation — and jeopardize their alliances with the United States. But a small group in South Korea, including some conservative members of the ruling party, and some in Japan see the North Korean danger as too grave to rely only on the protection of another country. They also question whether, despite rhetoric from U.S. officials about an “ironclad” alliance, Washington would really use nuclear weapons and risk the lives of thousands of American troops should a belligerent North Korea attack. The Chosun Ilbo, South Korea’s top newspaper by circulation, said in an editorial weeks after North Korea’s nuclear test in January that discussions in Seoul on acquiring nuclear weapons were inevitable. Judging by the level of American involvement in crises in Ukraine and Syria, for example, the newspaper said any U.S. help would come only after Seoul is turned into a “pile of ashes” by a North Korean nuclear attack. Yukio Okamoto, a former Japanese diplomat, said Tokyo “is in the most difficult position” because it is a nuclear bomb victim, surrounded by potentially hostile nuclear-armed states and dependent for its survival on U.S. nuclear deterrence. “We have to walk through a very narrow passage of trying our sincere efforts toward total elimination in the long term, but at the same time trying to preserve the alliance with the United States and not to tarnish the security relationship, especially the nuclear deterrence,” Okamoto said. Obama’s trip to Hiroshima will be filled with images of the horrors of nuclear war, and lofty statements about the need to eliminate those weapons. But some argue that for the visit to be successful, it must highlight Asia’s real nuclear dangers. Many conservatives in the United States believe a Hiroshima visit will be a failure because it will be seen as an apology. Nonproliferation activists believe he has not gone far enough in efforts to “earn” his Nobel Prize. AP writer Ken Moritsugu contributed to this report from Tokyo. WASHINGTON (Web Desk) – Barack Obama will become the first sitting American president to visit the site of the US atomic bomb attack in Hiroshima, Japan, later this month, the White House said Tuesday.The visit fulfills a wish Obama expressed early in his presidency to visit the charged location where tens of thousands of Japanese civilians were killed in a nuclear blast at the end of World War II. Weighing the visit, the White House officials faced a careful balance of whether Obama’s presence would amount to an apology for using nuclear weapons, a move many historians consider essential to ending the war, the CNN reported. Today Hiroshima is the site of a park and museum dedicated to memorializing the victims of the attack and promoting peace and nuclear disarmament. The president’s visit will “highlight his continued commitment to pursuing the peace and security of a world without nuclear weapons,” the White House said in a statement. According to the White House, the United States does not owe Japan a formal apology for using the atomic bomb in August 1945. But officials say the visit will serve as a reminder the terrible destruction that nuclear weapons can inflict. Rhodes said Obama would deliver remarks on nuclear non-proliferation – a central tenet of the President’s foreign policy – during the stop in Hiroshima, which is scheduled for May 27. Japanese Prime Minister Shinzo Abe would accompany Obama on the stop, which comes after a meeting of the Group of 7 in Ise-Shima. Earlier this year, Secretary of State John Kerry became the highest-ranking US official to pay respects at the site, and hinted that Obama would soon make his own visit. Obama and his aides have long debated making a presidential stop in either Hiroshima or Nagasaki, where the US dropped a second atomic bomb three days after the Hiroshima attack. On his first visit to Japan in 2009, Obama expressed a desire to stop in one of the cities before leaving office. “The memories of Hiroshima and Nagasaki are etched in the minds of the world, and I would be honored to have the opportunity to visit those cities at some point during my presidency,” he said. But even in Tokyo, a visit by a US president to the site of the nuclear destruction hasn’t always been welcome. Ahead of Obama’s first trip to Japan in 2009, a Japanese government official said “it would be premature to include a visit to Hiroshima,” recommending instead that Obama remain near the capital. But as the United States and Japan have worked through other World War II-era grievances, a visit to the location became more tenable. 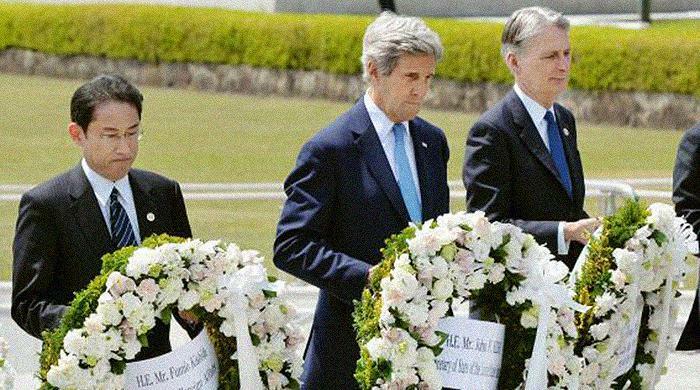 HIROSHIMA: US Secretary of State John Kerry on Monday called his visit to a memorial to victims of the 1945 US nuclear attack on Hiroshima “gut-wrenching” and said it was a reminder of the need to pursue a world free of nuclear weapons. The first US secretary of state to visit Hiroshima, Kerry said President Barack Obama also wanted to travel to the city in southern Japan but he did not know whether the leader’s complex schedule would allow him to do so when he visits the country for a Group of Seven (G7) summit in May. Kerry toured the Hiroshima Peace Memorial and Museum, whose haunting displays include photographs of badly burned victims, the tattered and stained clothes they wore and statues depicting them with flesh melting from their limbs. “It is a stunning display. It is a gut-wrenching display,” he said. “It is a reminder of the depth of the obligation everyone of us in public life carries…to create and pursue a world free from nuclear weapons,” he told a news conference. After the tour by Kerry and his fellow G7 foreign ministers, the group issued a statement reaffirming their commitment to building a world without nuclear arms but said the push had been made more complex by North Korea’s repeated “provocations” and by worsening security in Syria and Ukraine. The ministers from Britain, Canada, France, Germany, Italy, Japan and the United States laid white wreaths at a cenotaph to the victims of the August 6, 1945, bombing, which reduced the city to ashes and killed some 140,000 people by the end of that year. While he is not the highest-ranking US official to have toured the museum and memorial park, a distinction that belongs to then-US Speaker of the House of Representatives Nancy Pelosi in 2008, Kerry is the most senior executive branch official to visit. “Everyone in the world should see and feel the power of this memorial. It is a stark, harsh, compelling reminder not only of our obligation to end the threat of nuclear weapons, but to rededicate all our effort to avoid war itself,” the chief US diplomat wrote in a guest book. At Kerry’s suggestion, the ministers also made an impromptu visit to the Atomic Bomb Dome, the skeletal remains of the only structure left standing near the hypocentre of the bomb explosion and now a UNESCO World Heritage site. Three days after a US warplane dropped a nuclear bomb on Hiroshima, another atomic bomb was dropped on Nagasaki, on August 9, 1945. Japan surrendered six days later. A visit by Obama could be controversial in America if it were viewed as an apology. A majority of Americans view the bombings as justified to end the war and save US lives, while the vast majority of Japanese believe it was not justified. Hopes for Obama’s visit to Hiroshima were raised after an April 2009 speech in Prague when he called for a world without nuclear weapons. He later said that he would be honoured to visit the two nuclear-attacked cities. The G7 foreign ministers’ trip to the museum and memorial is part of Japan’s effort to send a strong nuclear disarmament message from Hiroshima, the world’s first city to suffer atomic bombing. “I think this first-ever visit by G7 foreign ministers to the peace memorial park is a historic first step towards reviving momentum toward a world without nuclear weapons,” Japanese Foreign Minister Fumio Kishida said in a statement. He later told a news conference that it was “inconceivable” that Japan would ever decide to have nuclear weapons. Last month, US Republican presidential candidate Donald Trump said Japan and South Korea should build such weapons to deter enemies. In a separate, detailed statement, the G7 ministers singled out North Korea for sharp criticism, condemning its recent nuclear test and launches using ballistic missile technology. And in a statement on maritime security, they voiced their strong opposition to provocative attempts to change the status quo in the East and South China Seas, an apparent reference to China, which is locked in territorial disputes with other nations including the Philippines, Vietnam and Japan. HIROSHIMA, Japan (Reuters) – John Kerry will not offer an apology for the United States’ use of the atomic bomb against Japan when he becomes the first U.S. secretary of state to visit the Hiroshima Peace Memorial Museum on Monday, a senior U.S. official said. Kerry is visiting the city, which was obliterated by a U.S. atomic bomb on Aug. 6, 1945, to attend gathering of foreign ministers from the Group of Seven (G7) advanced economies that Japan opened on Sunday with a call to end nuclear weapons. The U.S. diplomat is to join his counterparts from Britain, Canada, France, Germany, Italy and Japan on Monday to tour the city’s atomic bomb museum and to lay flowers at a cenotaph for its victims, becoming the first in his post to do so. “If you are asking whether the secretary of state came to Hiroshima to apologise, the answer is no,” a senior U.S. official told reporters late on Sunday. “If you are asking whether the secretary and I think all Americans and all Japanese are filled with sorrow at the tragedies that befell so many of our countrymen, the answer is yes,” the official, who spoke on condition of anonymity, added. Kerry’s trip could pave the way for an unprecedented visit to Hiroshima by a sitting U.S. president when Barack Obama attends the annual G7 summit to be held in Japan next month. While saying the White House has yet to make a decision, the senior U.S. official said Obama has shown he is willing to do controversial things such as visiting Havana last month. Japanese Foreign Minister Fumio Kishida, who presides over the two-day meeting, on Sunday said ministers will discuss anti-terrorism steps, maritime security and issues related to North Korea, Ukraine and the Middle East. 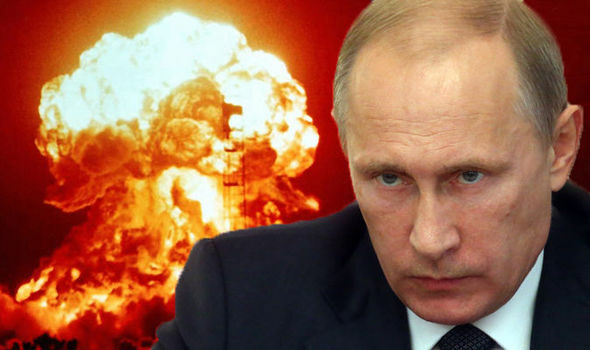 A NUCLEAR war in Europe is highly likely to happen soon as relations with Russia become even more strained, a former Russian foreign minister has threatened. Russia has been warned about intimidating its neighbours with talk about nuclear weapons by NATO’s secretary general Jens Stoltenberg, voicing concerns among Western officials. But Mr Ivanov blamed a missile defence shield being set up by the United States in Europe for raising the stakes. Part of the shield is a site in Poland due to become operational in 2018 which is particularly sensitive for the Kremlin because it brings US capabilities close to Russian borders. The US and NATO say the shield is designed to protect Europe against Iranian ballistic missiles and is neither targeted at Russia nor capable of downing its missiles. Russia could not be the eastern flank of a “failed greater Europe”, he insisted. “We have less nuclear warheads, but the risk of them being used is growing,” Ivanov said at a Brussels event with the foreign ministers of Ukraine and Poland and a US lawmaker. NATO’s secretary general Jens Stoltenberg has warned Russia of intimidating its neighbours with talk about nuclear weapons, publicly voicing concerns among Western officials. Ivanov blamed a missile defence shield that the United States is setting up in Europe for raising the stakes. “It can be assured that once the US deploys its missile defence system in Poland, Russia would respond by deploying its own missile defence system in Kaliningrad,” Ivanov said, referring to Russia’s territory in the Baltics. INDEPENDENCE, MO. A leading nuclear arms expert, exploring what he called the dangerous and “logically illogical” world of nuclear weapons, endorsed the Iran nuclear treaty Aug. 9 as a vital step towards moving the world to ban these weapons of mass destruction. Richard Rhodes, author of the Pulitzer Prize-winning “The Making of the Atomic Bomb” and four other books on nuclear weapons, said the recently signed treaty buys time, slowing nuclear proliferation. “The treaty is a good deal,” he said in a talk that was part of a commemoration ceremony on the 70th anniversary of the U.S. dropping of the atomic bomb on Nagasaki, Japan. That bomb, dubbed “Fat Man,” burned out an entire city, immediately taking some 36,000 lives. Nuclear weapons continue to be stockpiled — some 13,000 worldwide — based on false thinking, Rhodes said, that they deter war. This is the deterrence theory, Rhodes said. Behind this theory is the notion of “mutual assured destruction,” or, MAD, the idea that no enemy would ever strike first with a nuclear weapon because it would mean certain retaliation. So any use of a nuclear weapon would be suicidal, as Rhodes explained the theory. Deterrence advocates, Rhodes said, like to cite the fact that deterrence has worked and that nuclear weapons have not been used for 70 years as a result of deterrence. He called this dangerous, misguided and shortsighted thinking. Rhodes attempted to peel back the psychology of building and stockpiling weapons that, if used, would lead to self-annihilation. He questioned the logic of modernizing nuclear arsenals by making weapons smaller and more precise delivery systems. Such weapons and delivery systems, he said, bring the world perilously closer to crossing the taboo boundary from conventional to nuclear war. Once crossed, he said, most experts agree that an escalation to larger and more deadly nuclear exchanges is almost certainly inevitable. Why such irrationality? Rhodes asked. Why build weapons that can never be used? The answers, he said, can be found in the work of psychologists who have interviewed U.S. government officials on their thinking about nuclear weapons. No government official, Rhodes says, wants to publicly admit what scientists well know — that all people are vulnerable in the nuclear age and that no government can protect them. So officials preach illusions. “When the primary role of government is to protect its citizens, no officials wants to admit such protection is impossible to provide,” Rhodes said. This same reluctance to speak honestly, he said, has led President Obama, who in 2009 in Prague pledged to work towards a nuclear-free world, to more recently propose spending half a trillion dollars across the next decade, and another half-trillion in the two decades after that, to modernize U.S. weapons and their delivery systems. However, Rhodes said he is cautiously optimistic we can break out of our illusions and can ban nuclear weapons from the planet. He says we have only one or two generations of time to choose between banning nuclear weapons or being destroyed by them. He dismissed those who say nuclear weapons cannot be eliminated because the technology can’t be uninvented. Rather he said they can be made illegal, and tough international policing can prevent nations from secretly breaking out of an agreement. “One requirement for nuclear elimination will be continuous worldwide monitoring and physical inspection on demand as well as airtight accounting for fissile materials, for highly enriched uranium and plutonium,” he said. Rhodes cited a positive trend that he said is setting the stage for banning nuclear weapons. He said there is a scientific consensus today that even a limited nuclear exchange, such as an exchange of several bombs between India and Pakistan, would alter global temperatures by several degrees, leading to mass starvation across the planet. The Islamic State is preparing for a ‘final battle’ with the West, a terror expert has claimed. As air strikes mount in the terror group’s heartland, jihadists will attempt to increase attacks in response, geopolitical analyst Dr Theodore Kasik said. His claim comes days after ISIS leader Abu Bakr al-Baghdadi pledged to attack the West, and as cities across the world tighten security at New Year’s Eve celebrations. Dr Kasik told The Sun, the leader’s message released on Boxing Day was a call to arms and that Baghdadi’s promise of more terror attacks and a ‘final battle’ was a tactical change that was enforced by the recent air strikes. ‘ISIS is getting hammered in the Levant relentlessly by a combination of the US-led Operation Inherent Resolve and Russian strikes,’ he said. In London, every firearms officer will be on duty for the New Year celebrations tonight in an unprecedented security operation. Scotland Yard has cancelled leave for more than 2,000 armed police – the first time it has taken such a step. It comes amid intelligence warnings that Islamist fanatics may be planning a terror attack in a European city – although there is no specific information to suggest London is the target. Last night, officials in Brussels announced that the city’s New Year celebrations had been cancelled as the Belgian capital remains on high alert over a Paris-style terror attack. Mayor Yvan Mayeur said the decision had been made because officials could not guarantee being able to ‘check’ all attendees. In 2014, some 100,000 people turned out to enjoy the festivities and fireworks display at the Place de Brouckere. Austrian police have stepped up security in Vienna and other cities after receiving a warning of possible attacks. Moscow’s Red Square, traditionally a place where Russians gather to ring in the New Year, will be closed to revellers amid mounting security concerns. Meanwhile, in New York, 6,000 police officers will join an estimated one million people who will turn out to celebrate New Year’s Eve in Times Square.